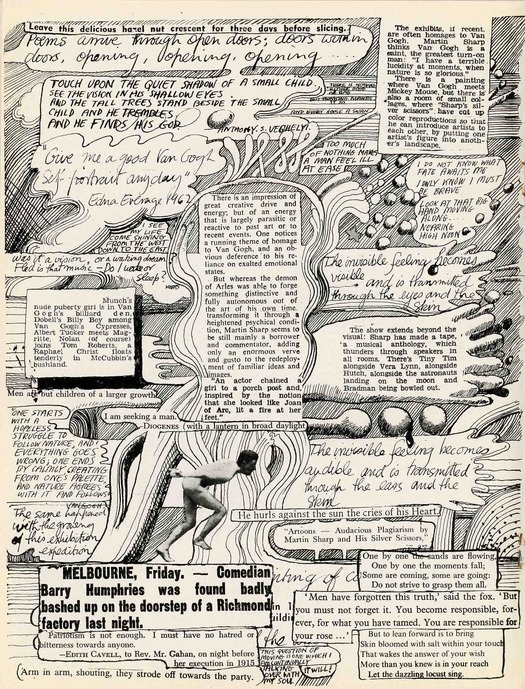 I was saddened to hear about the death of the Australian graphic artist Martin Sharp. In the 1960s, Sharp (born in 1942) was a brilliant innovator in illustration whose cartoons, collages and designs erased artificial distinctions between applied image-making and fine art. 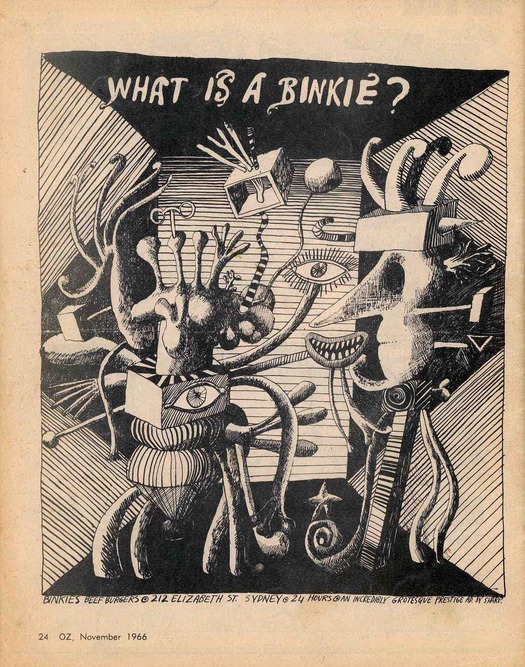 I first saw his work in the 1970s, as a teenage reader of the tail end of the underground press, and decades later it has lost none of its charge for me. 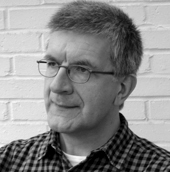 To read Sharp’s obituaries and commentaries is to be reminded of the difficulties of accurate assessment that his work poses. 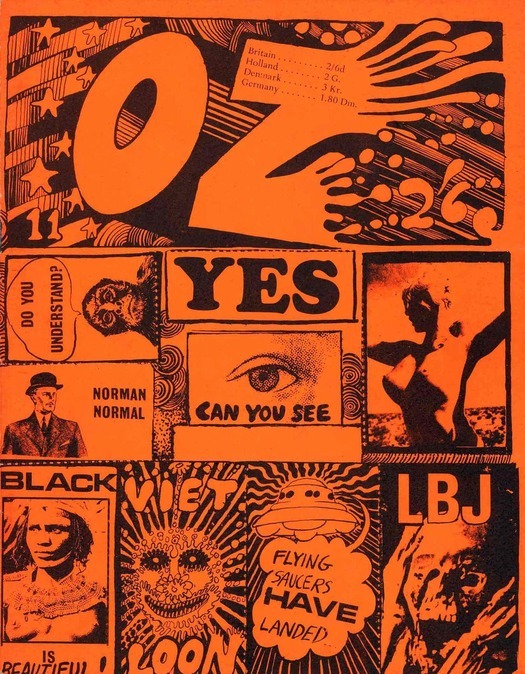 British admirers of his artwork for Oz in London and his psychedelic posters and record sleeves have most likely never seen his work for the first Australian Oz and know little or nothing about Sharp’s activities after he returned to Sydney. Australian admirers won’t know much about Sharp’s work for London Oz unless they have access to old copies of the magazine. The handful of iconic images of covers and posters circulating on the Internet give only a partial sense of Sharp’s visual concerns in those years. Sharp didn’t make it easy for would-be chroniclers. For years I wanted to interview him and, in September 2001, on my first trip to Australia, I finally had a chance. I had never seen an interview with Sharp in the UK design or art press about his early career and my hope was to produce a Q&A for Eye, presented in its “Reputations” series, with extensive illustrations. Even making contact with Sharp proved difficult and I was advised to go through an intermediary. But the arrangement was confirmed and I went to the rambling mansion he inherited from his grandmother in Bellevue Hill, an affluent Sydney suburb favored by art gallery owners, property developers and surgeons. 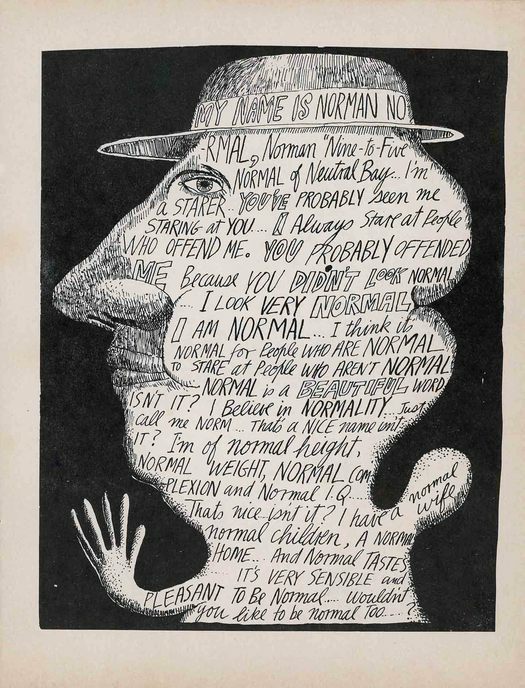 I had done some library research, read a few old Australian profiles and photocopied a wonderful 1966 catalogue of Sharp’s cartoons published in Oz, the Australian, the Sydney Morning Herald and elsewhere. It seemed that Sharp had been obsessed for many years with the singer Tiny Tim and with a fire that had taken place in 1979 at the Luna Park amusement park in Sydney, killing seven people. He loved Luna Park and it was a calamitous personal turning point for him. He believed the victims were murdered. Sharp was welcoming and polite, if a little distant. He walked me around, showing me his ultra-bright, cartoonlike, thickly encrusted paintings, which he famously worked on obsessively for years. He talked with animation about Tiny Tim and Luna Park and his research into the fire. 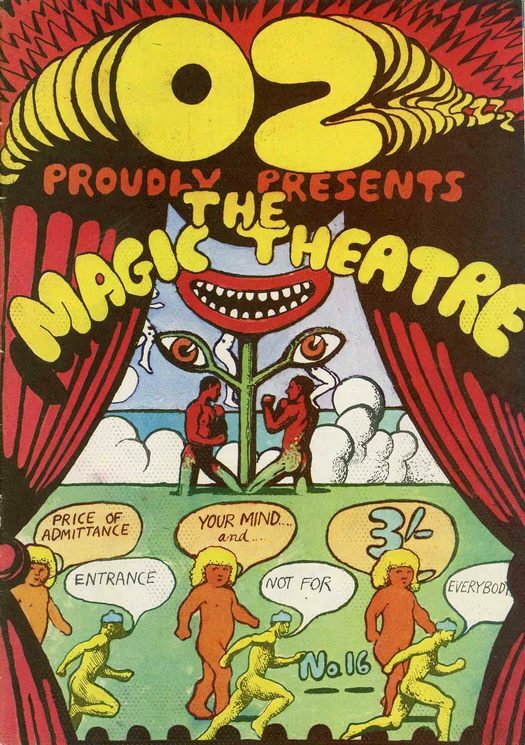 When it came to recalling the long-gone era of countercultural, psychedelic London, there was little he wanted to say and certainly not enough to sustain a Q&A. It was one of just two occasions I have known when a face-to-face interview produced nothing I could publish. I wondered whether there was some way of salvaging the situation, but back in London the distance was too great to make it happen. The story has a nice coda, though. 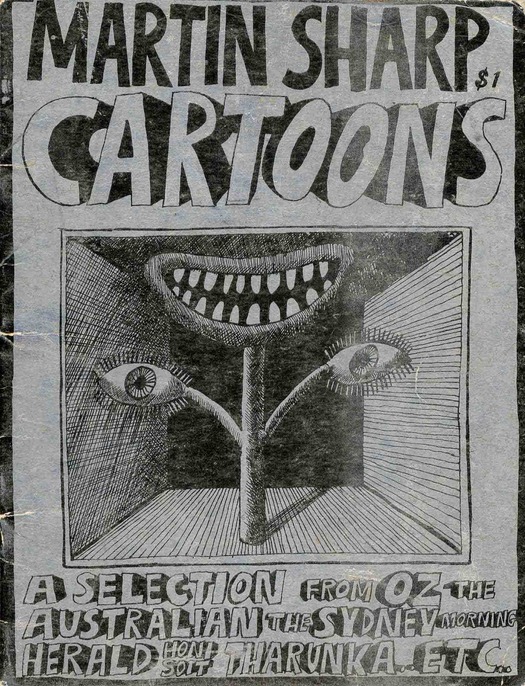 On a visit to Melbourne in 2002, an academic named Keith Robertson gave me some issues of the Australian edition of Oz, a copy of the 1966 Cartoons selection, and Catalog, an extraordinary publication by Sharp from 1971. Having wondered when and how to use these gifts for 11 years, I’m pleased to show some pages here. 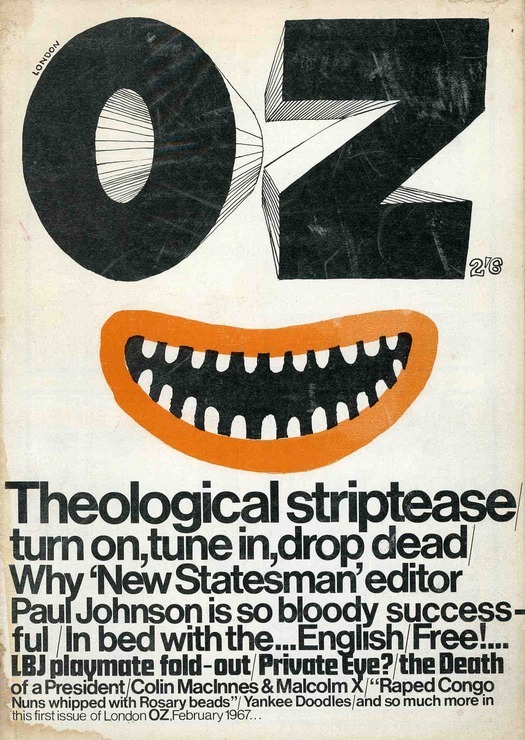 Sharp continued his editorial interweaving of word and image in the first issue of the new Oz in February 1967, which he announced with a leering toothy mouthpiece — in a photo in Neville’s 1995 memoir Hippie Hippie Shake, taken soon after they arrived in London, Sharp holds a similar cutout mouth on a wire in front of his own. 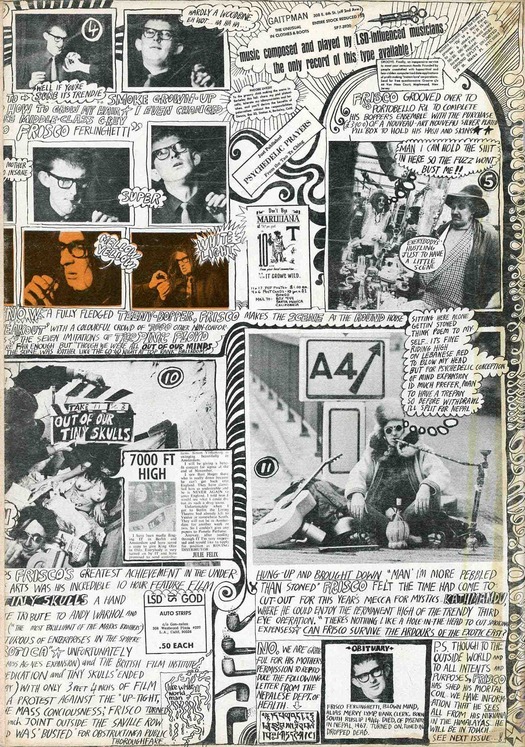 At the back of the issue is a three-page fold-out section by Sharp devoted to a hippie-fied photo-strip with collage elements, inky embellishments and lengthy handwritten captions, titled “The Somewhat Incredible Turning on of Mervyn Lymp, Bank Clerk.” (See the back cover above.) 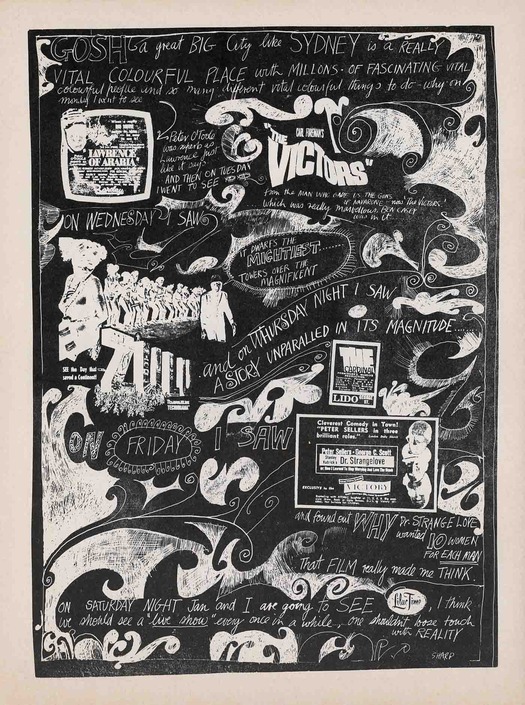 The densely composed strip anticipates the even more violent collision of word and image that would follow, two years later, in Sharp’s “Magic Theatre” issue. Over the years, this prodigious 48-page volcanic lava flow of collage has received admiring mentions — I have written about it myself in Design Without Boundaries — though mainly from those who experienced its full impact on publication, since it’s now so hard to see. 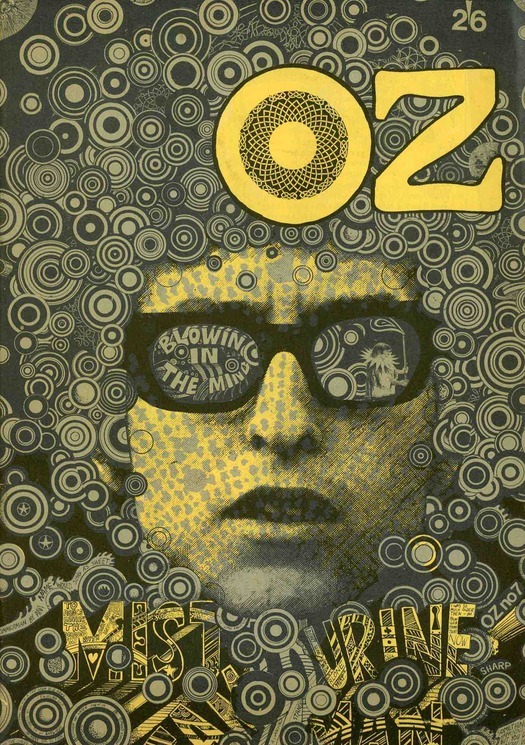 The radical writer David Widgery, who contributed to Oz, dubbed it, “the one thing created by the psychedelic era which might be looked at with interest in 100 years’ time.” The late Robert Hughes, art critic, was also impressed. Casting aside any conventional notion of magazine content and structure, dispensing even with the editors, Sharp and an assistant performed a demented Frankenstein suture-fusion of purloined images of news stories and headlines, small ads, comic books, Hollywood movies, bodybuilders, starving children, John and Yoko, Chang and Eng, Eadweard Muybridge, Winsor McCay, Max Ernst, René Magritte, and Robert Crumb. There is a speech-bubble running commentary from Sharp, quotations from Shakespeare — “It is a tale told by an idiot, full of sound and fury, signifying nothing” — and Tiny Tim is in there somewhere, too. The magazine remade as a theater of everything. 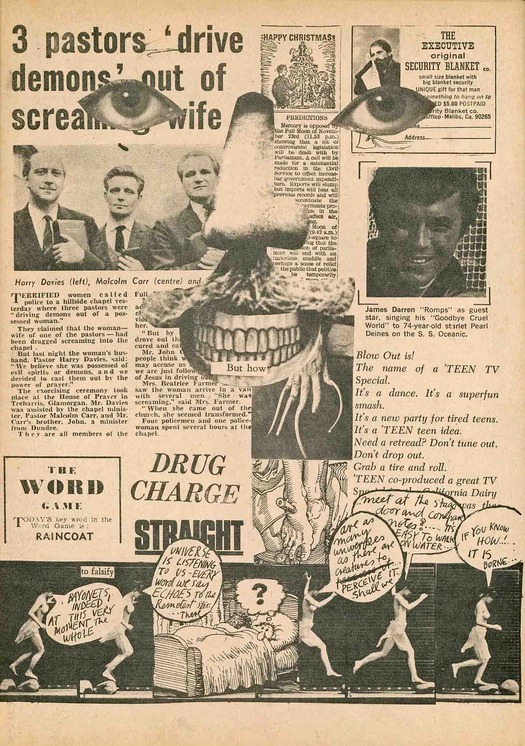 At root, this looks like it is still satirical social commentary, but it is commentary conducted with ambivalent new tools, a viscerally intense graphic/psychedelic anatomization that both manifests and critically explodes the self-indulgent pharmacological consciousness of the late 1960s. Sucked into the global maelstrom of politics, disaster and the media spectacle, Sharp arrives at tragicomic conclusions — “Price of admittance your mind” — that seem close to despair. In another memoir of the era, In the Sixties, Barry Miles remembers Sharp coming into the Indica bookshop in London, where he worked as manager, and buying an expensive book of Van Gogh’s paintings. “To my horror he immediately began tearing out the pages,” Miles writes. “It was his book, of course, and I knew that he was intending to use them for his collages, but I hate to see books mistreated. He tore out the pages he wanted and tossed the mutilated book in the wastebin.” Whether this memory is embroidered or not, it supplies an indelible vision of the artist’s urge to cut up the object of desire, the world, into new configurations, and it is absolutely in tune with the obsessional qualities that Sharp showed in his 1960s art-making and for the rest of his life. He wasn’t in any sense disrespecting Van Gogh. 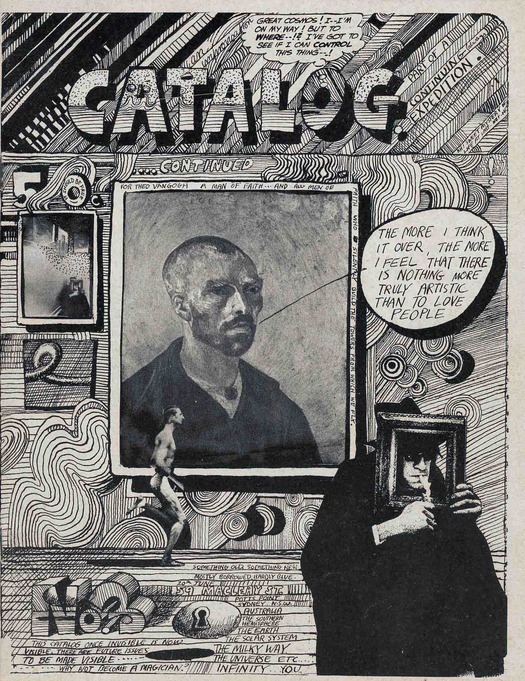 His repeated quotations of the artist in projects such as the miniature paired-painter collages in Art Book (1972) were an act of allegiance and celebration. Sharp seems never to have been interested in playing by the art world’s rules and his work in the 1960s falls between the spheres of art and design. 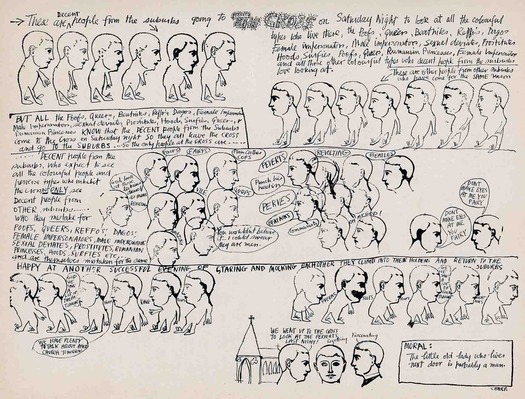 A paper by Anthea Gunn published in 2010 in the Journal of Australian Studies, examining his “dual identity” as a graphic artist and visual artist and how he resolved it, is a sign that proper consideration of his early career might finally happen now. A scholarly monograph that connects every area of Sharp’s practice, brings his less familiar work to light, and explores the complexities of his innovative graphic art is long overdue.